This high performance serum contains a concentrated blend of antioxidants, nourishing plant oils and retinol to protect skin and minimise the visible signs of ageing. With a luxuriously rich texture, it nourishes and restores dry skin leaving it smooth, hydrated and glowing. If you have mature skin it is likely that acne/pore related issues will be solved by retinol - I have been barking up the wrong tree with niacinamide but I think that is better for younger skins who have always had oily skin/large pores rather than the age related pore problem - like mine! I've always used retinol but have recently upped my game after running out of various different products. The difference was literally overnight. I chose PC as it is loaded with all the other ingredients I am looking for: it's fully comprehensive! The texture is slippy but not greasy and a little goes a very long way, so I believe it is good value for money. After application I allow it to settle and that slip disappears after less than a minute. It as a lovely feeling for dry winter skin and is extremely soothing. In the summer I will probably switch to a lighter formula. I love how thick this is, but I have dehydrated skin. I let it sink in but I only use it on my forehead and around they eyes or wherever the wrinkles are starting to form. I will say that I found using this AND a moisteriser caused congestion on my skin, so now I use it by itself. RB - Saved my skin in a day!? After one day this serum had noticeably reduced the rosacea that's been plaguing me for months. I was a little wary as my skin issues were kicked off by severe allergies (phenoxyethanol) that caused contact dermatitis and rosacea - so definitely sensitive skin now. This stuff felt completely fine, made my skin look almost redness-free after 2 applications! I've never had such an amazing reaction to a product. Trial size is a great idea - will definitely be purchasing more. Amanda - retinol effect continue! Bought the trial size and initially was going to return! Thought it was clogging my pores after I used it as a daily mixer for the SPF50 youth extending moisturiser which was not moisturising enough for me. Well, I was wrong and I reckon maybe some "purging" was going on from all the retinol with my pores actually bringing stuff to the surface in order to clear themselves. Anyways, this is a heavy, almost greasy product but this means a little goes a long way and it provided the moisture that my skin was lacking from the daily moisturiser. I wouldn't use under makeup though, apart from under the eyes. Unfortunately, all the PC SPF moisturisers I've used caused my eyes to puff up so I use this product as my daily eye cream, it's great as it's thick enough to use on its own under my eyes. As it happens, I use 5 PC products with retinol in and my under eye area has been transformed, my dark circles are much lighter, eye bags reduced and fine lines gone, my husband has noticed and I don't use a whole bunch of cover up products anymore! Pity I don't know which product's responsible or whether it's the combination effect so I'll just have to say it's the retinol effect! I have very dry sensitive mature skin, so I thought I would give this a go. My skin doesn't normally tolerate retinol or glycolic acid products very well so I approached this with caution. This has an almost like vaseline texture and I found it sat on my skin and was far too greasy for use around the eye area. The positives were I didn't have an adverse reaction and it didn't dry out my skin, but I saw no improvement to the functioning and appearance of my skin. I wouldn't repurchase. I can't say if this product would be beneficial in the long term,as my skin had a reaction to it. A lot of stinging and redness. A definite no go. Each person is individual though, and I do have very sensitive skin. 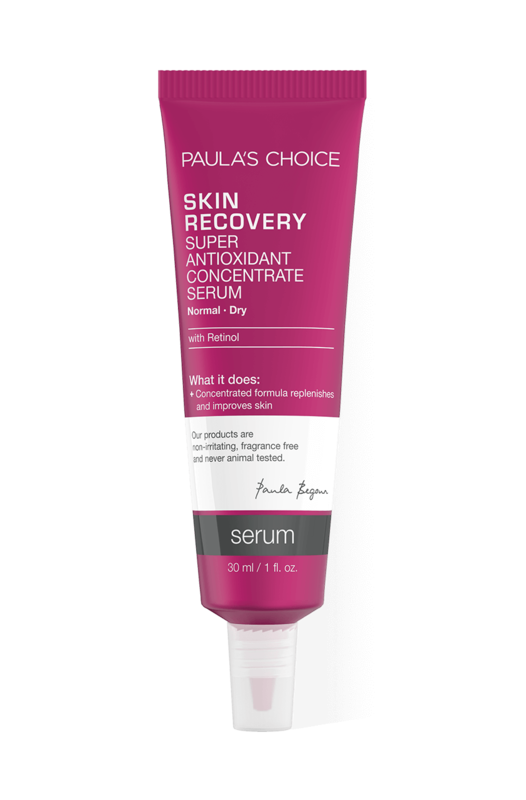 I don't think it was the retinol that's to blame, as I have used Paula's other retinol products with no problems at all. Customer Care: We are sorry to hear about your experience, please make sure to contact Customer Care if you need assistance in finding an alternative. I have been reluctant to try any skin treatment containing retinol as I was worried that it would irritate my skin and lead to dryness and eczema. However, this serum feels great and has made my skin feel smooth. I don't find it particularly greasy or moisturising and still have to combine with thick moisturiser on top but then my skin is probably on the extreme end of the dry skin spectrum. The trial size was enough for more than 2 weeks of daily application and is a great way to try out a new product. I have now splashed out on a full-size tube of this. The help desk team have also been amazing at resolving an issue I had with the delivery - polite, helpful and very quick to reply. I am a very happy customer and I will continue to use Paula's Choice products. I am using this product as an eye cream only (it gives me spots if used on the rest of the face) and I have noticed that the skin around the eye is more even and lines less pronounced. It is by far the best eye cream I have ever had and works great under makeup as well. Yeah... too oily for me. Was a bit alarmed when the serum didn't seem to sink into the skin as readily as others (!) but I suppose this is for very dry skin. I might need it if I have ever over-exfoliated or been under the sun and got burnt. Dawny - An indulgent treat for my picky combination skin! I had tried the other PC serums for combination skin and loved the Skin Balancing one. Then I received three sample packets of the Skin Recovery serum as a gift. My skin has always hated thicker, heavier products, and even the lightest skincare products are unsuitable. So I didn't have high hopes for this thick, oily formula. On using this serum, I was pleasantly suprised. It is WAY too heavy for everyday/daytime use for my skin, as it is SO thick, heavy and greasy, even oily to the touch, but I found it was perfect as a treat! I use it very occasionally, once a week - maybe twice, only at night, and after cleansing, toning and exfoliating using other PC products. I don't use moisturiser with it either. I take my hair back and leave it a couple of minutes to sink in. It does take a little while to be fully absorbed, but it feels lovely once fully gone and my skin feels moisturised and soft, but not oily or greasy. It would be great for very dry skin, but combination skins will probably not react well. I will continue to buy the small trial tubes to treat my skin, especially in the summer months when I am looking forward to trying it in hotter weather! I don't like this at all, the texture is gooey like a glue and it left a residue on my face. Amazing product. I have combination skin overall and get dry skin on my cheeks, which get a bit rough in winter. This is the only product that I've ever used which turned rough dry skin overnight into smooth complexioned loveliness. I haven't yet used it on the oily areas of my face as I feel they would benefit more from a different serum, but for any normal or dry skin, this is amazeballs! I actually have easily congested break out prone skin, but this used after the salicylic gel is my perfect match. While the salicylic acid gets to work dissolving congestion, this incredible serum glides on like an oil & soaks in beautifully. I was nervous as oily things on my skin usually result in blotchy, red & even more congested skin. After spending silly amounts of money, I am right back where I started - Paula's Choice. I don't know why I stepped away but was lured by expensive high street products that make big promises. Ultimately, Paula's Choice works best, it has impressive ingredients that work well together. Amongst her other products, I love this serum and will never change again. Unfortunately this serum did nothing for my dry skin. It left me feeling itchy, red, irritated, and very flaky. It also somehow stopped my moisturizer from working properly. When I do not wear this serum underneath, my moisturizer does what it is supposed to and my skin feels fine. But if I put this serum on and then my moisturizer on top, it's like it seals my skin off and the moisturizer can't get through. Maybe it's the silicons and they form some sort of barrier? Anyway, I can't use this now, as it is not moisturizing enough on its own to keep my skin feeling comfortable. Shame, as I still have a lot of it left.Customer care : Thank you for your review. We are sorry to hear of your experience with this product. While this response is not typical, we do understand that each customer is uniquely different in how they will respond to products or ingredients. This along with everyday environmental factors can sometimes play a part in how someone will ultimately respond to a product or combination of products. Our customer care department will contact you. Jar736 - Lost for words!! This serum has completely transformed my dry, bumpy, irritated skin. I felt and saw the benefits almost straightaway after using a couple of samples. Just ordered a full size tube. I've run out now so my full size tube can't arrive quick enough. Love the way it goes on and then sinks into the skin. Skin feels silky soft. Cyclopentasiloxane (hydration), Dimethicone (hydration), C12-15 Alkyl Benzoate (texture-enhancing), Olea Europaea (Olive) Fruit Oil (antioxidant/emollient), Tocopherol (vitamin E/antioxidant), Retinol (skin-restoring), Tetrahexyldecyl Ascorbate (vitamin C/antioxidant), Bisabolol (skin-soothing), Tocotrienols (antioxidant), enisonedA (skin-restoring), Tetrahydrodiferuloylmethane (antioxidant), Tetrahydrodemethoxydiferuloylmethane (antioxidant), Tetrahydrobismethoxydiferuloylmethane (antioxidant), Camellia Oleifera (Green Tea) Leaf Extract (antioxidant/skin-soothing), Vitis Vinifera (Grape) Seed Oil (antioxidant/skin-soothing), Chamomilla Recutita (Matricaria) Flower Extract (skin-soothing), Arctostaphylos Uva Ursi (Bearberry) Leaf Extract (antioxidant), Stearyl Dimethicone (emollient), Astaxanthin (antioxidant), Glycine Soja (Soybean) Oil (non-fragrant oil/antioxidant), Vitis Vinifera (Grape) Seed Extract (antioxidant/skin-soothing), Oenothera Biennis (Evening Primrose) Oil (non-fragrant oil/antioxidant), Vaccinium Macrocarpon (Cranberry) Seed Oil (antioxidant), Rubus Idaeus (Raspberry) Seed Oil (non-fragrant oil/antioxidant), Vaccinium Myrtillus (Bilberry) Seed Oil (antioxidant), Elaeis Guineensis (Palm) Oil (non-fragrant oil/antioxidant), Alcohol Denat. (preservative). 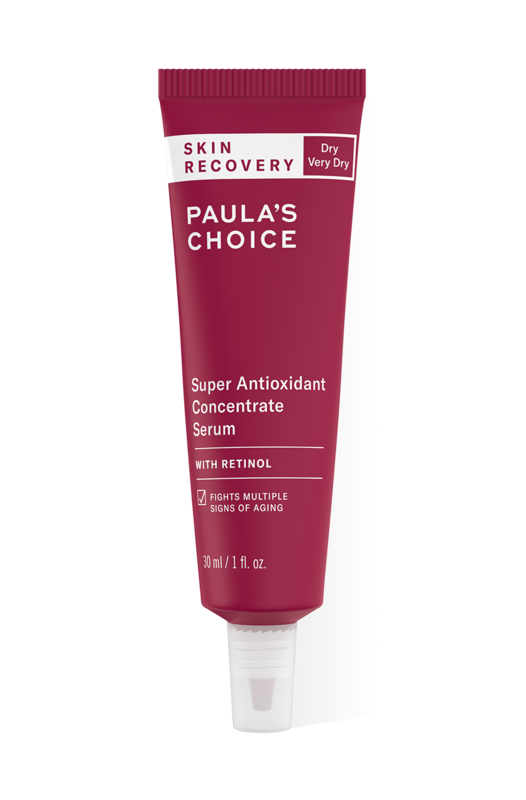 How does the Skin Recovery Super Antioxidant Concentrate Serum differ from the other retinol products Paula’s Choice offers? Formulated especially for dry, sensitive skin, Skin Recovery Super Antioxidant Concentrate Serum is packed with skin-defending antioxidants, restorative plant oils, anti-irritants and retinol. Those with dry, sensitive skin should always begin with lower levels of retinol and see how their skin responds before moving to higher concentrations. The percentage of retinol needed for efficacy is generally between 0.01% and 1%, which is quite a range, but further proof of just how powerful retinol is! All our products with retinol may be used with Skin Recovery Super Antioxidant Concentrate Serum or on their own, as each treats skin to a beneficial range of anti-ageing ingredients. I use a prescription product with retinoids. Since Skin Recovery Super Antioxidant Concentrate Serum contains retinol, is it OK to combine them? We are not aware of any contraindications surrounding the use of prescribed retinoids and retinol and believe this combination is beneficial to skin. Because this question concerns a prescription drug, we recommend consulting your physician and following his or her advice before using Skin Recovery Super Antioxidant Concentrate Serum. Is Skin Recovery Super Antioxidant Concentrate Serum suitable for those with rosacea-prone skin? Research has shown that retinol can reduce inflammation that leads to symptoms of rosacea. The other antioxidants and soothing agents in Skin Recovery Super Antioxidant Concentrate Serum will help calm redness and soothe skin as they deliver anti-ageing benefits.